Following the selection of the TOP 10 London startups on the 7th of August, the teams were mentored by leading industry professionals and were given two months to practice their pitches and refine the business strategy. The winner of the Regional Final, ThinAirWater Ltd, was awarded a prize of £500, four free tickets to the Innovation Forum 2017: Leaders Conference and, most importantly, a chance to be part of the Global TOP 20 startups at the Global Final in Oxford on the 5th of December 2017. The second, Neo-Innovations UK Ltd, and third team, CortiCare, were awarded one free ticket each for one of their members to attend the Innovation Forum 2017: Leaders Conference. The format of the Regional Final was structured in pitches of a length of strictly 3 minutes and 10 minutes for questions. The pitches were done in front of 80 attendees and a panel of four highly experienced judges: Letizia Goretti (Director for Portfolio Management and Business Operation for Johnson & Johnson Innovation), Dr. Patrick O’Brien (Performance and Projects Manager at MedCity), Dr. Thomas Prock (Chartered UK, German and European Patent Attorney) and Peter Bachmann (Director at Scottish Equity Partners). Coming in third place, CortiCare aims at to build a point of care device for affordable, quick and accurate hormonal testing. Founded by Imperial College scientists Rafael Michali and Renato Circi, CortiCare is a proprietary technology consisting of a two-part device capable of carrying out endocrine analysis from a single drop saliva. Find out more at https://www.corticare.co.uk. In the second place, Neo-innovations UK Ltd aims at preventing the 25,000 deaths linked to deep vein thrombosis. Founded in 2013 by Neomi Benett, a Kingston University graduate and registered nurse, the startup aims at providing Neo-slip, a device facilitating the application of medical stockings for patients and carers by reducing the friction between stocking and skin. In the last two years, Neo-slip has gained approval for listing on both the NHS Formulary and NHS supplies. Find out more at http://neo-slip.co.uk/dvt-and-neo-slip/. Finally, congratulations to ThinAirWater Ltd again for winning the competition. Many thanks to our judges and anyone who attended the competition. See you next year! 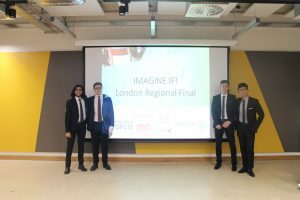 The winners of the Regional Final, ThinAirWater Ltd (left to right): Muhammed Maktari, Sam Bruggen, Jonathan Risley and Jansen Teng.